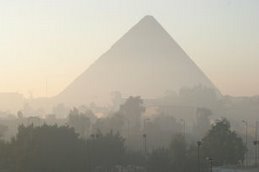 From @egyptologynews. Happy St Patrick's Day for tomorrow! Open Air Museum. Temple of Tod. Where on earth is this year going?? I cannot believe that it is mid-March already. Further to my previous, keep an eye on the #Save_antinoupolis hashtag if you want to follow this story. Copied from @egyptologynews. Not a lot of news over the last few days, but some very disturbing and upsetting news about continued looting of sites. Copied from @egyptologynews. Most recent news is at the top. Copied from @egyptologynews. Most recent at the top. Yesterday's news from the world of Egyptology, copied over from Twitter. Copied from @egyptologynews. Apologies that this is such a long post. I've been up to my ears in work and haven't had time to do much. But this covers the period between 25th Feb and 2nd March, in no particular order as usual. I was very glad to attend the Margaret (Peggy) Drower memorial evening at the @PetrieMuseEgypt last week. Great speakers and great stories. We are not far from the halfway point in the first, two-month part of the spring season, and making good progress with the three main tasks set for this period. 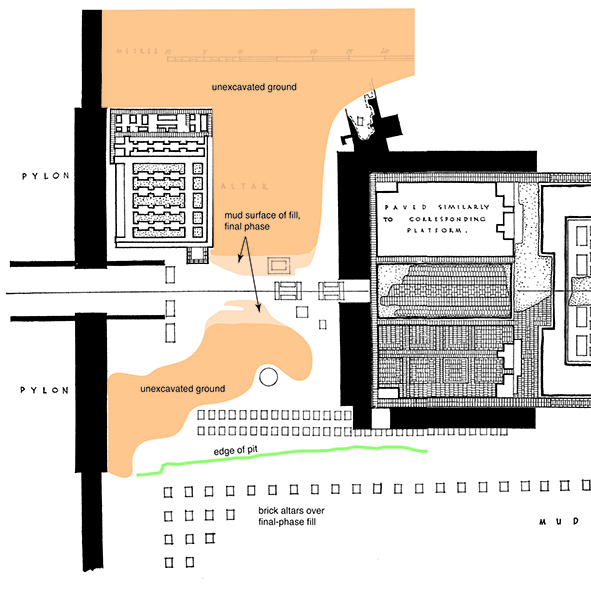 The first is the continued re-examination of the front part of the Great Aten Temple. We are continuing to remove the large Pendelbury dump that lies over the mud-brick pylon and also obscures the view of the temple from the road. A long stretch of the pylon is now revealed, including more of its mud-brick threshold and access ramps. 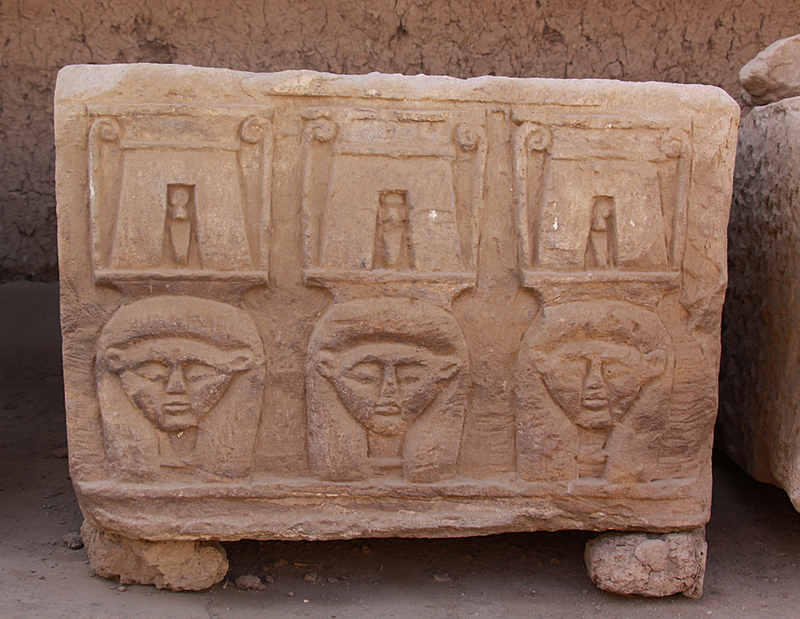 The dump has produced its crop of sculpture fragments, including a fine piece of indurated limestone (resembling marble) carved with hieroglyphs and made to be inlaid into another kind of stone. Further into the temple area and along its axis, the work began with the clearance of another stretch of Pendlebury's trench along the axis. Two sets of gypsum-lined basins surrounding an offering space, first exposed in 1932, have survived remarkably well. They had been remade several times over. One of them had been partly filled in by Pendlebury with unwanted fragments of sculpture which have now been added to our extensive collection. At the higher level of the later temple floor, a simpler basin, also lined with gypsum, has also survived. Although very close to the modern ground level, the mud floor behind it, that Pendlebury did not excavate, has also survived well, and contains at least one more set of gypsum-lined troughs surrounding a rectangular area that has not been revealed before. The front part of the temple, therefore, was the site of activities that involved the pouring of water on a sufficiently regular basis to necessitate periodic renewal of the gypsum linings. It was also a practice that was retained when the temple was rebuilt and its ground level was raised. Further still along the axis, into the temple front, lie two conspicuous rectangles of gypsum concrete that seem to have been massive foundations for sets of huge columns that stood in front of the stone pylon. The top of one of these rectangles has now been cleaned. The gypsum surface onto which limestone blocks had been laid, leaving their impressions behind, is in better condition than expected and is in the course of being re-planned. The curious insets around the edges, especially on the east where they would have fronted the pylon, turn out to have originally been filled with limestone blocks, presumably to create extra-strong foundations to support unusually heavy weights. Large sculptures come to mind. The concrete podium was built as a series of compartments, the lower parts filled with a calcareous gravel. 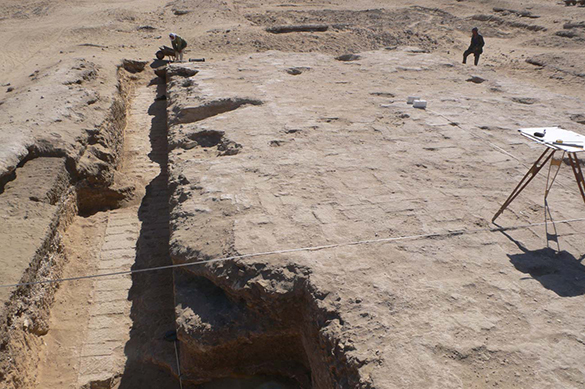 A closer study will add further to our knowledge of Amarna building techniques. Pendlebury's plan shows it surrounded by gypsum foundations at the foot of a trench. The foundations bore the impressions of stone blocks, that belong to a surrounding retaining wall for the concrete and might not have risen to ground level. Stretches of this feature also remain although long parts were probably destroyed even when Pendlebury excavated the trenches. Banked against the outside of these walls is a complex stratigraphy that relates to the building of the later-phase temple. This is in the process of being elucidated. A hieratic jar label of regnal year 12 found in debris beneath the level of the temple's final floor is a useful pointer to when, in Akhenaten's reign, the major enlargement of the temple took place. 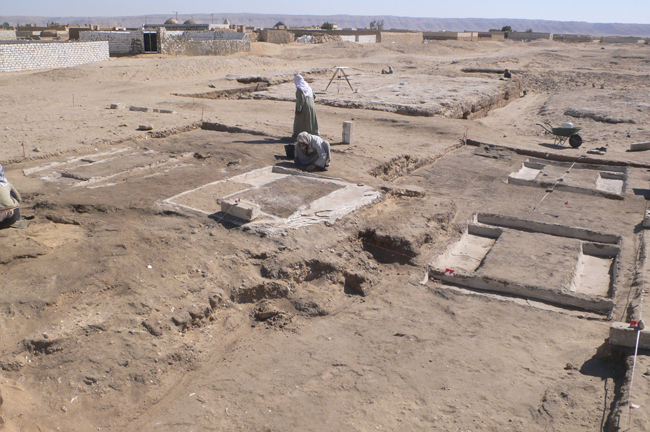 At the same time that the re-excavation is taking place, the small team of builders from El-Till is busy setting out the outlines of the stone building, the gypsum foundations of which were uncovered last year. There are two main components to this. The first is the marking of the positions of around twenty columns. 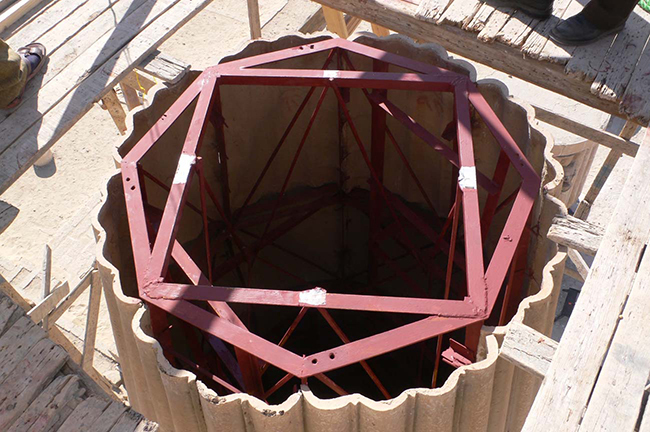 Our method is to create flat circular pads, 10 cm high, from white cement, standing on square foundations of small, local stone blocks. When the scheme is finished and a layer of sand is spread over the interior of the building, all that will be visible is a few centimetres of their height. The other component is the laying of a single course of stones along the lines of the original walls. To do this we have taken delivery of blocks made in the limestone quarries of Tura, just outside Cairo. They include corner blocks carved with prominent circular mouldings. In length and width the blocks copy the dimensions of the talatat-blocks from which the original walls were built. But we have increased the depth (from 23 to 26 cm) to be the same as the width, partly to increase the choice of surface that we can display and partly to compensate for the sand and dust that will quickly blow in and around the building. When finished, the interior will be filled with sand to within a short distance of the top, hinting at the higher floor level that the building original possessed. The inspection of the interior of the column at the Small Aten Temple, that was mentioned in the last bulletin as scheduled to take place, showed that, in the nearly twenty years that have passed since it was put up, the internal ironwork that holds it together has seen very little deterioration. This is a tribute to the skill with which Simon Bradley designed and built it. Nevertheless, to make sure it has a long life, two of our workmen cleaned the surfaces and gave them two coats of red oxide paint. That done, Simon and a local carpenter worked together to create a thick, robust wooden cap that is now securely bolted over the top of the column. The outside of the column has generally weathered in quite a pleasing way. The one part that shows deterioration is a wide panel with a flat surface let into the side that, on the original, showed Akhenaten and Nefertiti worshipping the Aten. Simon had originally given this a different finish to the rest of the column, providing it with a coat of smooth plaster. This has been cracking and falling off over the last few years. Simon's current task is to remedy this. We have until the end of March to complete the season's work at the temples. Then the second major part of the programme for 2013 will commence. This is a return to the South Tombs Cemetery for a further excavation. 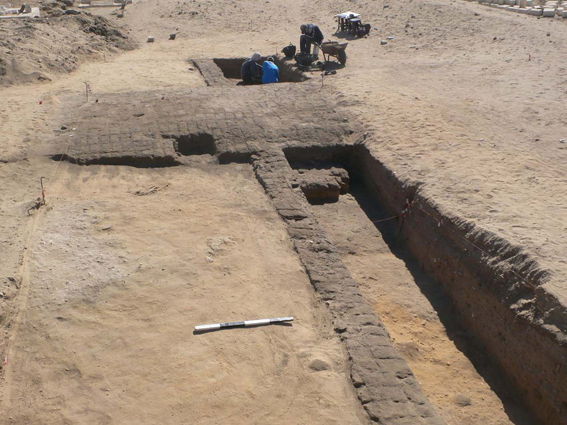 It remains, once again, to thank our supporters, who make the work at Amarna possible.